Teint de Neige perhaps should have been called Fond de Teint, and Lorenzo Villoresi said it all himself describing this perfume: “…the rosy hue of a powdered face. The unmistakable scent of perfumed powders, the fragrance of face powder, the perfume of talc, a soft, gentle, enveloping eau de toilette. An aroma delicately permeated by the richness of the natural extracts of precious flowers, recalling the light, images and atmosphere of the belle-époque". So why Color of Snow, surely that would imply transparency, wateriness, coldness, pure whiteness...Teint de Neige is none of those things, it is a powdery, warm, creamy-pink scent. It is somewhat similar to Malle's Lipstick Rose, sharing with it that “fragrance of expensive retro cosmetics” concept. However, whereas rose and violet bring some juiciness to Lipstick Rose, Teint de Neige, though also (somewhat) floral, is a drier, more powdery scent, with heliotrope adding a lovely almondy feel to the drydown. Teint de Neige is rather an intense fragrance. I wouldn’t be able to wear it often or spray it generously. However, when the mood calls for it, when the weather is cold and life is miserable, nothing can comfort quite like Teint de Neige. It would be unfair though to only categorize it as a comfort scent. In my (admittedly random and unprofessional) classification of scents, it is also filed as a Pinup Perfume. Teint de Neige is extremely attractive, perfectly made up (all that powder), sexily attired, it strikes a pose, it smiles suggestively. It is a bombshell. 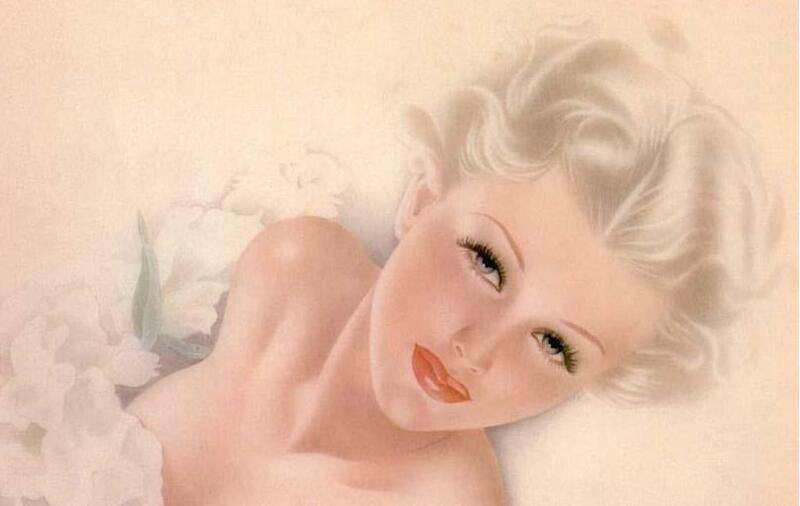 To illustrate my point, here is May by Alberto Vargas, Teint de Neige personified. Next, two more Pinup Perfumes, both by Frederic Malle. Hee! R., no, not Loukhoum, not tomorrow anyway...but I sort of have a feeling what I am reviewing tomorrow is not your cup of tea either :-) I maybe very wrong though! Lovely review! Teint de Neige was definitely too powdery for me. I like powder, however something about TdN is a bit overwhelming. Yet, on a right day, it is just want I need. Somehow comfort scents are powdery for me as well. Thank you V! Exactly how I feel about TdeN too, sometimes it is too much, and it is not powderiness I blame, it's some note there...don't know what...but sometimes it works like a charm. Love the idea of pinup perfumes. For me, I need a warm simple vanilla for a comfort frag, usually. Or soliflors. Soliflors are somehow more comforting to me in some ways than any multilayered scents - can't put my finger on why, though. I'm rather looking forward to a review of KM Loukhoum... I could list SL's Rahat Loukhoum among my comfort scents but it's too complex and heady. And it *really* needs cold weather. I haven't sampled any KM yet -- here in Paris, they're only available at Le Printemps and I loathe department stores, except for le Bon Marché because it's always almost empty. So, yes, looking forward to that review... And I'm sort of hoping you'll do Musc Ravageur, which, oddly enough given its name and reputation, smell very comforting to me. I will definitely review KM Loukhoum (and Montale Sweet Oriental Dream) one of these days...I love Musc Ravageur too, have to plot that review soon too!